(Bloomberg) -- The trade war is officially here. So is earnings season. Corporate America isn’t about to let one ruin the other. As executives prepare to release results for the second time this year, it’s the very companies with the most on the line in President Donald Trump’s commerce crusade that are poised to report the strongest second-quarter numbers. Technology, materials and energy stocks have the most overseas sales -- and the highest profit forecasts. While trade tension may have put a lid on investment gains, it has done little to earnings estimates. Through all the back-and-forth, analysts have been raising forecasts. They’re predicting 20 percent growth in the April-to-June period, the second-fastest rate since 2011, behind the first quarter. Technology companies, many of which rely on Chinese plants to manufacture chips, have traded sideways since reaching a record in June. 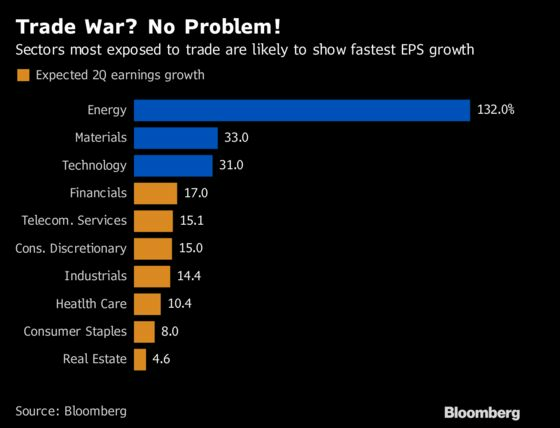 And yet the sector will probably show 31 percent earnings growth in the second quarter, data compiled by Bloomberg show. Energy firms likely saw their profits rise by 132 percent in the period, while materials firms likely posted a 33 percent profit growth in the same time. Sector-specific stimuli are outweighing trade concerns, according to Selkin. Software and Internet firms are insinuating themselves into the workflow of everything from banks to soapmakers to drug developers, boosting sales at a much faster pace than any tariff is likely to reduce them -- for now. Energy companies are feasting as oil prices hover near the highest level since 2014 and while commodity prices have been volatile, they spent the second quarter at levels comfortably above the year-ago period. “While tariffs pose a risk to market sentiment, the potential impact to aggregate S&P 500 EPS is limited given exports to China comprise just 1 percent of U.S. GDP,” wrote David Kostin, Goldman Sachs’ chief U.S. equity strategist, who said a trade war with China will hurt stock prices but not so much earnings growth. “Despite its limited aggregate impact, tariffs will have a disparate influence at the stock level,” especially on firms with high China sales, he said. Still, while materials companies have seen 12-month target prices dip slightly over the past three months, other industries have seen them rise. Energy and tech stocks saw analyst price forecasts rise by 6.9 and 3.4 percent, the most among industry groups.